Some hair loss is a normal and natural part of the hair growth cycle, but thinning hair shouldn’t be dismissed as just another sign of aging. ‘Male pattern baldness’ (which can affect people regardless of gender) isn’t inevitable. Instead, extreme hair loss can be the result of poor nutrition, stress, genetic variations, and other factors. I’m happy to say this means there are natural solutions for ‘male pattern baldness’! Around 50–80% of men are affected by male pattern baldness. The medical name for this condition is androgenic alopecia (AGA) because it is linked to changing levels of hormones called androgens. These male hormones (including testosterone) control the development of typical male secondary sexual characteristics, such as a deeper voice and beard growth. In typical cases of AGA, people experience severe progressive hair loss on the crown and front of the head (frontal hair loss), while the sides of the head and the rest of the body remain largely unaffected. Thinning hair results both from a decrease in the number of active hair follicles and a decrease in the health and thickness of the remaining strands of hair. There are several possible causes of AGA. An enzyme called 5-alpha-reductase converts testosterone into dihydrotestosterone (DHT), which causes hair follicles to shrink. Furthermore, high levels of DHT are associated with a longer “resting” phase and shorter “growth” phase in hair follicles, resulting in thinning hair. Changes in circulation to the scalp – as well as oxidative damage related to inflammation – may play a role in male pattern baldness as well. Hair loss may also occur due to insufficient amounts of several key nutrients needed for hair growth. For example, zinc is essential for the activity of numerous enzymes involved in hormone balance. Since it helps reduce 5-alpha-reductase activity to decrease the conversion of testosterone to DHT, it’s unsurprising that zinc deficiency has been linked to male pattern baldness. In addition, men with AGA (vs. those without AGA) are significantly more likely to develop metabolic syndrome (51% vs 28%), a condition associated with greater body weight, poor blood glucose regulation and higher blood lipid levels, and an increased risk of cardiovascular problems and diabetes. Men with AGA also have a higher incidence of prostate enlargement due to benign prostatic hyperplasia (36% vs 6.8%). This suggests a shared underlying mechanism related to hormonal health and metabolism. Given what we now know about the causes of hair loss in men, it’s easy to see how ensuring a good intake of zinc and other nutritional factors can support a healthy head of hair. Biotin is one such nutrient. Part of the B vitamin group, biotin helps promote the growth of strong, thick, healthy-looking hair and can help reverse the loss of hair and hair pigmentation (colour). Silicon and L-methionine are two other building blocks necessary for the growth of strong, healthy hair, while methionine plays a role in maintaining hair pigmentation. In other studies, soy isoflavones, including genistein, have been seen to inhibit the activity of 5-alpha-reductase, leading to lower levels of DHT. Epidemiologic research has also found that Taiwanese men who consume higher amounts of soy have a lower incidence of AGA compared to men who eat less or no soy. 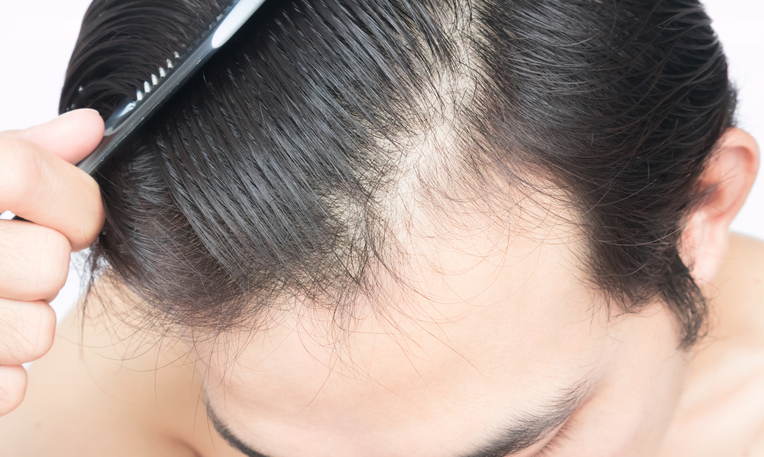 While sometimes dismissed as a purely cosmetic concern, androgenic alopecia can have a dramatic effect on self-confidence and quality of life and may be an indication of underlying health concerns that need addressing. If you are experiencing a sudden or gradual thinning of your hair, it is important to talk to your health care provider. You may also want to try Ultimate Hair Growth Formula, featuring a soy isoflavone extract alongside Capsimax™ Capsaicin, biotin, zinc, silicon, and the amino acid L-methionine. This comprehensive one-a-day supplement, available at health retailers, helps nourish and sustain healthy hair growth for people with AGA. Piraccini BM, Alessandrini A. Androgenetic alopecia. G Ital Dermatol Venereol. 2014 Feb;149(1):15-24. Leake A, Chisholm GD, Habib FK. The effect of zinc on the 5-alpha-reduction of testosterone by the hyperplastic human prostate gland. J Steroid Biochem. 1984;20(2):651-5. Agamia NF, Abou Youssif T, El-Hadidy A, et al. Benign prostatic hyperplasia, metabolic syndrome and androgenic alopecia: Is there a possible relationship? Arab J Urol. 2016;14(2):157-62. Yazbeck N, Muwakkit S, Abboud M, et al. Zinc and biotin deficiencies after pancreaticoduodenectomy. Acta Gastroenterol Belg. 2010;73(2):283-6. Schallreuter KU, Salem MM, Hasse S, et al. The redox-biochemistry of human hair pigmentation. Pigment Cell Melanoma Res. 2011 Feb;24(1):51-62. McCarty MF, DiNicolantonio JJ, O’Keefe JH. Capsaicin may have important potential for promoting vascular and metabolic health. Open Heart2015 Jun 17;2(1):e000262. Hernandez BA. Is androgenic alopecia a result of endocrine effects on the vasculature? Med Hypotheses. 2004;62(3):438-41. Harada N, Okajima K, Arai M, et al. Administration of capsaicin and isoflavone promotes hair growth by increasing insulin-like growth factor-I production in mice and in humans with alopecia. Growth Horm IGF Res. 2007 Oct;17(5):408-15. Bae M, Woo M, Kusuma IW, et al. Inhibitory effects of isoflavonoids on rat prostate testosterone 5a-reductase. J Acupunct Meridian Stud. 2012 Dec;5(6):319-22. Lai CH, Chu NF, Chang CW, et al. Androgenic alopecia is associated with less dietary soy, lower [corrected] blood vanadium and rs1160312 1 polymorphism in Taiwanese communities. PLoS One. 2013 Dec 30;8(12):e79789.